Lift the upper foam piece in the ear cup to access the battery compartment, place the AAA battery in the battery cell and make sure the red ribbon beneath the battery, it helps you remove the battery easily. To remove the battery, pull up on the red ribbon that runs under the battery, repeat for another if necessary. The headband is telescopic headband and it fits all head size, adjust the headband by sliding the ear cups in or out of the headband. For a proper fit, the ear cup should cover your ears completely. Turn on the power to each ear cup by rotating the power/volume control knob clockwise. When you hear a "click", the noise cancelling and ambient sound amplification function is on, and the volume can be adjusted to proper level. 1.Ensure the batteries are good and properly installed. 2.Turn the power/volume knob off, then on again. Note: Remember to power off both ear cups or remove the batteries when not in use, or it will peep, we specially design it to remind customers to power off when not use it. Each set of earmuff is inspected and adjusted to a standard frequency for comfortable use but it's still adjustable to suit your personal preference. To adjust the frequency, rotate the dial at the base of the power/volume control knob. Rotate the frequency control dial clockwise to hear more lower frequency(bass) sounds. Rotate the frequency control dial counter-clockwise to hear more higher frequency(treble) sounds. ►9X SOUND ENHANCEMENT: 4 wind resistant high frequency built-in microphones (2 on each side), amplify ambient sound around you (even a pin dropping) to normal levels. You won't feel isolated from your partners even when wear it for shooting. ►BLOCK OUT GUNFIRE AUTOMATICALLY: When the noise level reached 82 dB, the electronic noise reduction system will activate automatically to protect your hearings from sudden or sustained noise. Noise Reduction Rate 23dB. 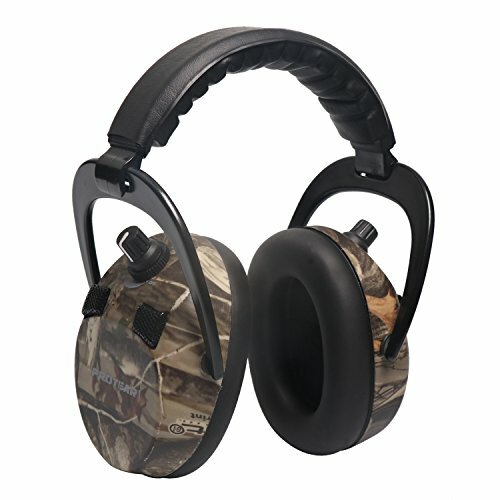 ►SPECIALLY DESIGN FOR SHOOTING/HUNTING: Four independent with iron gauze cover for true stereo sound make it easy to identify sound and direction. Two independent volume control knob and two independent frequency control dial helps you hear more lower frequency(bass) sounds and high frequency(treble) sounds. ►CUSTOM FIT AND COMFORTABLE WEAR: Padded leather double-foam ear cushion and adjustable telescopic headband fit all head size. It keeps comfortable even if wear it for hours and it won't slip even in position of shooting. Ultra-light weight 0.66 pound. ►ANSI S3.19 and CE EN352 TESTED & CERTIFIED: Noise reduction rating (NRR) of 23(dB), conform to American Standard, your satisfaction guaranteed or your money back, no reason needed. Powered by 2 "AAA" batteries, one battery on each side. If you have any questions about this product by PROTEAR, contact us by completing and submitting the form below. If you are looking for a specif part number, please include it with your message.